Thinking of getting your new home built? 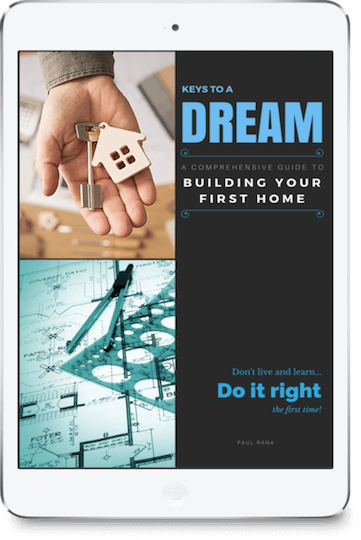 An indispensable resource for new home buyers, Keys to a Dream is full of great insider tips and guides you at every stage with practical information. Learn the tricks & traps, know the dos & don'ts and consider the pros & cons to make informed decisions tailored to your needs. No frills, no gimmicks, just an honest and unbiased guide packed with useful details to enable you approach a mammoth task with total confidence. 100% Money Back Guarantee if you're not happy with your purchase. Just let us know within 14 days for a full refund, no questions asked! Jam packed with valuable information, Keys to a Dream will help you plan and build your dream home in the best possible way. You will find trustworthy advice and suggestions that will save you money and time, frustration and heartache. From budgeting and finance to land and builder search, from customising your house plan to selecting the perfect inclusions, from construction start to completion all the way to handover, and finally moving in and even beyond! No need to hunt for advice and guidance from multiple sources and risk unreliable or even incorrect information. Our guide covers all aspects of planning and building a new home and much, much more. Along with great tips to save you money and ways to avoid costly mistakes, our guide will also save you a lot of valuable time that you would otherwise spend researching or learning from your mistakes. Don't get played by builders and their salesmen due to lack of knowledge. Extensive research on the subject and knowing all available options is the only way to negotiate the best deal. Below is an in-depth summary of our one-of-its-kind guide about the new home building process. Decide for yourself whether the contents covered are worth the price of the book for you, before investing a few hundred thousand dollars on your new home. We start with a list of everything that you should be budgeting for so you are well prepared through the build. Then comes selecting the right lender and the most suitable loan. We also compare the pros and cons of building against other available options. Next we find out what to look for in your perfect block of land to match your floorplan. Then comes choosing the right builder for your needs and comparing off-the-shelf vs custom builds, along with best practices for getting your tailored plans right. In these chapters we go deep into the diverse and complex world of inclusions and selections so you are aware of your choices. We will also look at ways to reduce costs, and then discuss the dos and dont's before you get to the crucial contract signing stage. Here we list the tasks before the constructions starts, and your role during the build. We look at everything from the required inspections, and then preparing for the practical completion. Then finally comes your to-do list before moving in and checklists thereafter. Not ready to buy Keys to a Dream yet? You're Awesome! Click Here to Download Now. You're Phenomenal! Click Here to Download Now. Need more information or have a specific query? and we will get back to you promptly. © 2016 PR Publications, a division of East India Trail. ABN 12 396 321 868. All rights reserved. Website created in-house. Contact Us for your web designing and e-commerce platform needs.